Just one hour from the city center. 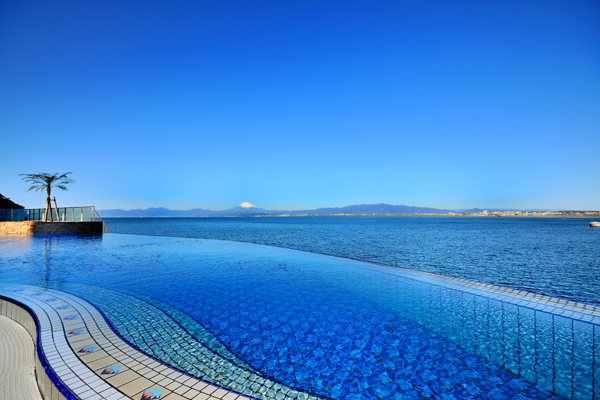 Let's enjoy the spa where your heart and body are pleased, on Enoshima surrounded by rich nature and Shonan Sea. Name Enoshima Island Spa "EnoSpa"
Have a single staircase in front of you. It is a recommended scenery outdoor pool. An indoor spa area full of resort atmosphere throughout the year. Various spa pool such as jet bath and sleeping hot water are substantial. Enjoy a relaxing bath time with "Fuji Kaitan" which is also called "hot hot spring" or a high concentration carbonated spring. You can taste the body-friendly spa cuisine with plenty of local fresh ingredients at the sea-view restaurant. Please spend an elegant time with a magnificent view of Shonan.